Yesterday we had a trip up to North Yorkshire to see my mum. We took her out for lunch at a large garden centre near Northallerton, mainly to be undercover and avoid the biting cold weather. The queue in the restaurant was long because of the school holidays and the staff had been taken unawares so there was a 30 minute delay for food orders. Luckily we were not in any rush and didn’t mind the wait – it gave us a chance for a good chat. Mum and DH had cheese and chutney sandwiches which were rather like doorstops and I chose a jacket potato – all came with coleslaw and salad but like many places these days the portions are very large – too large in my mind and not helping the obesity problem and we end up paying for a proportion of the food we cannot eat – I do wish these places would offer a smaller sized portion. Afterwards we had a wander around the ‘shop’ part, they sell decorative homewares, gifts, clothes and crafts as well as gardening products – a bit of a mini shopping centre. It was too cold to take mum outside and look at the plants so we moved on to Northallerton town centre. I love this market town – it has a good balance of independents and chains and you can find most things here. We ended up as we always do in Boyes for a mooch around while mum stocked up on a few heavy items like washing powder. We had to go and warm up again in a nearby Costa before taking her back home. She was so grateful that we had taken the trouble to drive up and take her out for an hour or two as my sister is away at the moment – it is a costly hour or two though when you add both the fuel and eating out costs but well worth it to see the smile on her face. Today I felt quite drained from the car journey and a little stiff so I decided to take it easy and sit and make a list of what I need to do this week for the 40th birthday party preparations. There is a bit of cleaning to do, a bit more tidying in the garden and a bit of this and that to decorate the place. Did I mention I am also going to attempt to make the celebration cake – if my oven doesn’t work then I will have to put the cake mixture in the car and drive round to my daughter’s house to use hers. DH thinks the problem with the oven might be a faulty element that surrounds the fan at the back of the oven. If we could fix this it would make meal planning and baking the birthday cake so much easier. He managed to buy an element and tomorrow he will have a go at replacing it. After all the listing and planning we went to town this afternoon to do our weekly shop and had a go at the self scanning system, new to Sainsbury’s – it was slow especially as I kept forgetting to pass the items over to DH to scan before putting them into the trolley. I think it will get quicker as we train ourselves to the new process. On the way to town we had a detour down a country lane to some nearby woodland so I could get a small branch for my Easter display that will hold the eggs I have decorated. I will post a picture once I have something assembled. I thought some outdoor Festoon lighting might be nice for the party – a bit of an investment perhaps as it is not very cheap – we cannot decide between some from IKEA that we saw on display or the cheaper ones in Dunelm which are in a sealed package so I cannot see the quality but they are a little bit longer. Tomorrow is Yoga again – maybe it will iron out some of my tight muscles. If the oven is fixed I will bake the cakes – if not it will be the garden tasks as my daughter is out for the day. The figures never lie – but surely I didn’t spend THAT much….did I? I thought I had March under control as far as our spending went but sometimes the reports tell a different story. We had similar trips to last month and trips = petrol which in turn = cost. Our grocery bill stayed at the same average weekly rate which was disappointing and cards and gifts came in more expensive due to a special birthday gift and Mother’s Day. The most expensive categories appear to be eating out and home and garden – could they have been better…let’s find out….. Almost exactly the same in March as February – not surprising as we had a visit to Scotland and North Yorkshire yet again. We also spent £6 on the park and ride fare to Leeds for the financial seminars. The MOT and car service for our estate car was actually done in April so a bit of a reprieve here on the March costs. I never mind spending on this category if it keeps me fit and well. Bendy I am not at the moment – still there is hope. We switched our electricity provider from Scottish Power in March to a dual fuel contract with SO energy who provide us with our gas. They are a hit with us on two counts; good customer service and extremely clear statements, which come in on time every month so you know how much you have spent. Without the benefit of the good weather we had in February, March was a much cooler month and our gas bill reflects this but only by a few pounds. The total bill for groceries and whole foods alone was much the same this month as last, £314 with the average also remaining the same at £78. I liken my weekly shopping costs to a Slimming World weigh in – I was convinced I had spent less but in truth I had not, though as with a weigh in remaining constant is better than gain and obtaining a constant average of £75 since the beginning of the new year is I think worthy of a prize. I have managed to build up a bit of a stock of some items – not intentionally, not for Brexit even, but in order to take advantage of the items on offer – so my figures reflect stock rather than foods eaten. I do have in the back of my mind that when Brexit happens we may face shortages so maybe it is no bad thing to have a bit of a stockpile. Included in this category are toiletries and this month I bought another Neal’s Yard frankincense serum. They offered me 20% off and I had just run out. I heard on the news that the price of stamps was going up so I called in to our local post office and bought 12 first class and 24 second class for £21.96. As I don’t use many stamps other than at Christmas I will now have them ready and at the old price. I usually prefer to buy the Christmas design stamps for my cards but when you are on a pension needs must. I will decorate the envelopes with some pretty rubber stamps instead. And I confess to three magazines £10.99 Country homes came with Woman and Home as a deal and Simple Things – who can resist a bit of a spring fling and the ideas contained in them have sparked some creativity. I had no frivolous purchases this month for the house but as spring got underway a few replacement tools were needed for the garden – anvil loppers, secateurs and a very useful small hand fork for tight spaces. Our one expensive impulsive purchase was the small corded Dyson – not a planned expense at all, bought more out of necessity from thinking ahead. Our Dyson at home is quite heavy now to manoeuvre and carry up and down the stairs, while the one we have at the caravan is so much lighter (the downside being that you have to empty it more often). Presently you can still find old stock in the shops but soon both the corded vacs and the small lighter models will be obsolete. Surprisingly, the exact same model we bought for the caravan in April 2017 with the insurance money was £50 cheaper and came with a larger selection of tools. I had two special cards to buy this month – a 70th birthday and a Mother’s day card, for the rest of the birthdays I was using my old stock of bought cards so managed a bit of a saving here. I bought mum a basket of plants £10 and spent another £40 for my friends 70th, a theatre voucher to share with his wife who will also be 70 in May. They like going to see musicals so although this will not buy them a seat each it will go someway to the cost, or if they are hard up too she could sit on his knee! Crafts and hobbies don’t come cheap and knitting is one of them. I spent a whopping £15 on patterns – generally they seem to be £3 each in the shops – but I have now enough to keep me going a while. I like to be able to read the pattern before I buy it so I can tell if I might be able to understand most of it. The King Cole Cottonsoft wool for my next project came from Boyes and was a reasonable £12.30 for 3 balls. I came across some cotton lace for the Christening dress from Boyes £8.60 for quite a few metres. I bought two books on knitting for £7.99, a novel called The Bookseller for £8.99 and a much-needed road map of Great Britain £7 to replace our old one that was now so far out of date some of the new roads are not shown. As we don’t have sat nav, a map is essential. It seems that even though we have been here, there and everywhere during March we have not actually paid for any entertainment or leisure activities; they came free. The most disastrous month so far this year and not because I had eased up on the packed lunches. If I break the figures down it has been a heavy month because we saw my mum at the beginning and end of March and even though we packed picnics on our days out we still managed a whopping £120.49 in the tea shops and cafes and buying a meal in Saltburn on our last visit in lieu of a Mothering Sunday lunch. But how can I begrudge her a little enjoyment. We also had the extra expense of eating out for the day in Leeds when we attended the financial seminars – although the seminars were free the food needed to keep us going all day was not! So with other drinks out over the month we managed to hit £63. I have done even better than I thought in this category and spent hardly anything. I bought two more long-sleeved t-shirts, one white and one black, they are so versatile and I had to buy them before they disappeared off the rail and replaced with the summer short-sleeved ones but that was all I bought. It is interesting how what you do through a month reflects on how much you spend. Having a visit to Scotland, and visits to see my mum and younger daughter are expensive trips – not only getting there (fuel costs) but eating out during that time. I notice too that the weather has some bearing on expenditure – now the sun is shining the garden needs maintenance and gardening like crafts are not cheap pastimes. Any outlay now should set us up for the year, or will it? So I will endeavor to muddle through another month – I know April is going to be harder to keep a tight grasp on the old purse strings as we approach Easter and a family party at the same time as well as numerous birthdays to cope with. Before I begin apologies for the photo quality – I was losing the light by the time I took the pictures. If you remember from one of my previous posts (click here) I had covered a number of blank cards in a variety of pretty papers from my craft pile to try to use them up. I set aside one or two to finish as Easter cards. This time, rather than buy the preprinted ‘greetings’ labels, I made my own on the computer and printed them out onto some card. If you want to make your own I use a Microsoft word document where you can select a text box, a font design and a suitable size of type for the card. I then add a border around the greeting and once printed cut the labels out carefully, almost but not quite, to the border line leaving a small white edging. I selected colours to match in with the prints and used different typefaces. I also added a ribbon decoration to some of the cards to finish them. Extremely simple and easy to make but I quite like the simplicity. I was then left with these little card motifs in my craft box of embellishments… Cute little cut out Easter pictures… I am not even sure where they came from but I have had them for years now and they have escaped going into the give away box once or twice. So this time it was either use them or lose them. I stuck the rabbit, chicken and sheep onto the Easter egg shapes and then placed them onto a small square card blank. There was no room to add a printed greeting so I decided to use my little alphabet stamps and just stamp straight onto the card. There was no need to be too exact – I actually like the lettering more when it is a bit wonky! Once dry I stuck the little motif in place and voila…. …these little bits have now made four delightful little Easter cards for the children – Libbie, Sweetie, Freddie and my great-nephew. On the back of each card I make I have a little stamp to say it is home-made. This one is my favourite from Vista print and given to me by my daughter one birthday, but I do have some rubber stamps too. Remember the birthday card made from a piece of decorative packaging I found – it may have been an old Panettone box from Christmas or something – I followed the design and embellished it with some of those stick on jewels in golds and rich purple colours. As well as stamping on the back of the card I often make a printed slip for the inside with a message. I think it gives a more finished look to a card and although I didn’t have time for this one, as I had to get it in the post, they do look lovely if you add a print too using a rubber stamp. So even if you do not have any expensive equipment you can make some really simple cards using any decorative paper or card, a Pritt stick, some double-sided tape and a sharp knife. If you do not have a printer you can buy sheets of greetings labels; but equally you could get a rubber stamp and stamp onto some plain card and then add a border and cut out. I am enjoying doing a few more creative things when I have the time and it does reduce the mountain of crafty bits and pieces I have been storing all these years – I was thinking of getting rid of some of it but that seemed a shame when in an afternoon I can make something useful. I like the challenge of creating something from very little so I think my next project will be using up scraps from junk mail, magazines and even the decorative parts of the inside of an envelope to make some cards. Hello there – it seems a while since I was here in my little space and I can’t even remember now where I have got to so apologies if what I say here has already been said once. You might have guessed I have been busy – what’s new! We had a weekend at home and to ourselves – if I remember we were both in the garden and I also did a few more cards – but more about that later. This week began with our usual shopping trip on Monday, first into town for a few bits and pieces and then round to the big Sainsbury’s on the ring road for the weekly food shopping. I say bits and pieces which they were individually but the cost collectively was surprisingly a bit much for one day. I went to Primark first to look at jackets. I have a brilliant hooded jacket I bought from Primark for £6 in 2004 when we bought the cottage. It is so useful in the garden in Scotland – an all-weather coat – it has a light waterproof nylon fabric on the outside, so no bits of vegetation or the like sticks to me, with a warm fleece lining and the hood is small so doesn’t blow off with the first puff of wind – absolutely necessary when you live by the sea. It is still going strong after many washes. Then across to Wilkos to look in the gardening section for Tomato food to feed both the bulbs and the tomatoes (when I get them sown) – it was much cheaper here than anywhere else at £3.25. On the way I noticed (as you do) a white Dicentra for £2 hung in the packaged bulbs display – I was tempted as I have wanted one for the garden at home for a long time but in the garden centre the plants are £10 which I thought a bit steep. I bought one and have planted it in the garden but I am doubtful about it growing as it just looked like a bag full of dry peat but I thought for the price I would give it a go – I also treated myself to a white indoor plant pot for £2. Before leaving the store I had a rummage in the crafts section as they have a lovely range of inexpensive Easter crafts to keep the kids busy. I came across these garden signs for £2 which will be useful for the Easter egg hunt we intend to do for the children at the party on Easter Sunday, weather permitting of course and, for Libbie, a sew your own felt chicken Easter basket £1.50. I then popped into the Works as I had a £0.50p voucher and wanted to buy some polystyrene eggs – ten for £0.50p with the voucher – I have an idea to cover them in printed tissue papers for Easter decorations for the party. It goes against the grain to buy polystyrene but I will be keeping them for a long time to reuse – had I got more time I would have done some hand painted real eggs – but that will be another year. I also bought a pack of stronger dowels to attach the garden signs to for £1. The bamboo basket in the photo above was a great find in Sainsbury’s for £2.50. The final stop was one of our local independent whole food / health shops – I often alternate between the two as I like them both and would hate to see either of them close down. I prefer them to Holland and Barret as they sell more organic foods and are often cheaper. Here I bought Almond oil which I use as a face cleanser and for massage, my high dose Solgar Vitamin D capsules, some Omega 3 oils and two packs of Kalo tomato stock cubes for the soup and to add flavour to rice – a grand ‘sit down’ total of £39.03. The food shopping was pretty normal and came in a bit cheaper than usual at £52.38 this included a few extra salad bits and some nice breads for the lunch I prepared today for my sister and brother-in-law when they called in on their way up north. I made sure to carefully whiz past the clothes and magazines – but I did buy these. I bought myself one for my desk at the beginning of the year and I love it (see here). Now you might be wondering what I would want with five more calendars that are all for this year especially now we are in April…..well I had another idea ( I think they must have put something in the water recently!!)…. Sainsbury’s had reduced them down to £2.10 and the metal stands which are gold or black are very sturdy and allow you to remove each calendar page by unscrewing the little nuts – my idea is to keep the stands and attach my own version of next years calendars using photos DH and I take throughout the year and give them as presents to my friends at Christmas. It could well be a gift that keeps on giving because you can use the stands over and over again so in following years I could keep giving a new set of calendar pages to my friends to fix onto their stands. Each year I might choose photos of a different theme such as seaside, towns, gardens etc. Did I mention last week I bought this cardboard Peter Rabbit egg from an old-fashioned sweet shop in Saltburn. I then bought a £1 Cadbury’s chocolate Easter egg and my idea is to remove the wrapper and decorate with little iced flowers and Libbies name to put inside. If the chocolate egg is in two halves then I will put some of those tiny shell coated eggs inside. So as you can see I am full of ideas – oh and they don’t stop there – oh no – nothing that simple – somehow I am now doing the 40th birthday cake for my SIL’s (son in-law) party on Easter Sunday …..mmmm…how did that happen…..retirement – exactly what is that?? Before I go welcome to my new followers. I will be back with more on my craft cards, the March Tally, the cottage update and a host of other things. What a lovely month April is – like a bridge between winter being well behind us and the promise of a warm and sunny summer to come. As we are already six days into the month and we have a family party coming up on Easter Sunday me thinks my intentions this month will have to be limited and swiftly executed. Another season upon us and another time of celebration coming up with Easter being near to the end of the month…a time for swapping a few decorations and accessories around in the house; putting away woolly hats, gloves and scarfs (I keep trying and then have had to bring them out again) and a few winter ornaments and bringing out something more colourful that reflects this season more. I have in mind to do some Easter decor this year as it looks so pretty in the magazines; a twiggy branch maybe with painted or decorated Easter eggs and a host of flowers. I have ideas (then I always have ideas – just not the time!). I really must complete the little hooded jumper I started before Sweetie has grown out of it, and she is growing fast (nicknamed pudding for the moment, but not in earshot). I have in mind to do some more cards and finish the Easter cards I started. I am going to try to print my own Easter greetings to stick on this time as I have not found anything appropriate in the shops. I only send a few out to family that I know look forward to receiving them and one or two friends that I like to keep in contact with more than just a card at Christmas. My next big project will be to make some progress on the Christening gown for Sweetie. I have some ideas for the design – my daughter would like it to be similar to our traditional vintage family gown and we have already bought the cotton lace, I just need to find some fabric and cut a pattern. I am assuming that by the end of April we will be enjoying salad once again and some lighter meals. I have put on a few pounds recently over the winter months and I am ever hopeful that they will drop off once we are not eating the calorie dense winter foods. That is my theory anyway…if the change of diet doesn’t work I shall have to do something more drastic. I have already swapped back to the fat-free yoghurt for breakfast and soon with a change of menu we will be eating fewer potatoes and starchy veg. Don’t ask me how (it wasn’t exactly at gun point) but I find that I have agreed to hold my SIL’s 40th birthday celebrations at our house as theirs is even smaller (and if you remember has all new cream carpets laid!). It will be mostly family… approx 20 people but even so I shall need to make the house and garden presentable, not perfect …it would never be that, but presentable. My daughter is going to order most of the buffet food from M&S, because I cannot guarantee that our oven would be working, and MIL is chipping in with pies and scotch eggs. I may have mentioned before that sometimes my oven heats up and sometimes it doesn’t but certainly is not reliable enough to cope with getting food cooked on time for a party. His birthday coincides with Easter Sunday so we will be doing an Easter egg hunt too for the grandchildren, and nephew. It is looking like the new pantry is going to be put on hold yet again! At least with the appearance of Spring I can escape into the garden for a while to release the stress. I have a few new plants to put in that I bought with my voucher. There are a few gaps to fill in and I would like to add a little more colour. I have seeds to sow too, tomatoes and courgettes, hopefully this weekend. If the weather is right I will also be treating the lawns with some feed and weed; for one reason or another we didn’t get it done last year. DH, under careful supervision, will be getting underway with the outdoor spring clean and painting the front door (in time for the party) …. and if it has dried out the new shed. Meanwhile I will be having a thorough clean in the main rooms, tracking down cobwebs and wiping down the woodwork to freshen the place up ready for the party. Last month I had begun clearing and cleaning the office but that will have to wait now as no-one will be going in there – I will just do that old trick of closing the door. Looking at our agenda for the month I think there will be little time for any trips so our Scottish visit will now have to wait until after Easter as I really don’t feel I can squeeze too much in. My sister is away again next week so I may be called upon to go up and see mum for a day or two as she is not getting out by herself now other than across the road to the little shop for her paper and the Deli for a morning coffee. Last Saturday while we were up in North Yorkshire at my daughters we took her out to Saltburn for lunch and Sandsend for a drink and a Yorkshire curd tart (they were delicious) and she was so grateful to get out for a while. We had a lovely day. Most importantly I have to look for suitable fabric for the Christening dress – Fabric shops are rare now but there are places in Bradford and Harrogate so we will treat it as a nice day out at the same time and see where we end up. During the time I am at home I have in mind to give myself a bit of a spring clean with a juice detox for a day followed by a brown rice and vegetable diet for a few days as this is very cleansing and full of vitamins and minerals. My system feels a bit sluggish after the winter. I will be keeping up with the Yoga, it has proved beneficial and I intend to do extra sessions at home. No big plans for this month other than to mind the spending and buy nothing that is not a considered purchase. DH has already been doing some utility switching with the fuel companies; he has also been preparing to leave BT when the contract ends in May. We have been looking at a new company with a good customer service record. It is not the cheapest but sounds reliable and is far cheaper than BT can offer us to renew. We will be seeing the financial advisor after which we can make some serious headway with investing the money we have saved towards our retirement and make decisions about the cottage. Meanwhile we are still working out ways to save as much money as we can or should I say ways to spend less money. I will talk more about this more on my March tally post. So that is my list of intentions for April – it is always interesting for me to see what I managed to accomplish at the end when I look back over the month. I keep trying not to pack too much in and keep a balance of rest and play but then find I am caught up in other people’s agendas…. but when it is family that need a helping hand I do like to help out where I can. I wrote at the beginning of March that we were beginning to lose that cold nip in the air…. but here at the beginning of April we have it back again and a possibility of snow. Really isn’t it Spring now? …..well it has hailed once or twice here and covered the grass with icy crystals. March was certainly a busy month …I would even say a ‘far too’ busy month, and if I didn’t achieve all my intentions then it wasn’t for the lack of trying. It is always a shorter condensed month at home when we spend some time in Scotland and usually I have to roll over some things I had intended to do. On the whole I was pleased with getting started on the knitting, a yoga class and attending the financial seminars – all part of my ‘transitioning’ plans for this year. So looking back on last month how did I do? I joined the weekly Yoga class – I have done two sessions now, one of them last Tuesday morning. Anita had kindly tailored this class around shoulder exercises which helped my restricted left arm and although it is a bit achy now it feels better for the movement. I must remember to move more and not get stuck on the computer for long periods. I have been doing some facial massage using the free facial oil samples sent to me by Neal’s Yard. I am following some instructions I tore out of a magazine – I am not sure I can see a big difference but it certainly leaves your skin very soft. I think the wrinkles are still there though! No matter how many times I thought about it I never got to mix together the ingredients for the facemask so that is next on the list. I have a small avocado in the fridge to use up so I will add a sprinkling of oatmeal and lemon juice. Both gardens have had the majority of our time and attention this month. We bought new heavy-duty anvil loppers and have been severely cutting back some of the overgrown shrubs. It takes time to get them into a pleasing shape and decide which of the buds to cut down to not to mention dealing with the mountain of prunings afterwards. DH put up the new cupboard in the garage to house our vacuum cleaner and gardening coats and remove them from what is to become the pantry. We actually bought a new upright Dyson because we wanted a small lighter weight one (like we bought for the caravan) but not cordless and so we had to move fast as once the stock of these in the shops has gone they will be unavailable. Our problem with the cordless is that the batteries are so expensive to replace once they stop charging properly as all these cordless machines do in time, and I like the flexible hoses on the corded vacuums for doing the stairs. There has been no other work done in the pantry, and no paint put on the front door and no spring cleaning of the gutters and paths – these will be some of the roll over tasks for April. I had intended to do more spring cleaning than I found I had time for so I am reverting to clearing out and cleaning in small stages and this is working better for me. Instead of trying to tackle the whole office at once, which was a bit of an overwhelm, I began with the two desk drawers – the top drawer that houses all the stationery items, post it notes, highlighter pens, punch, calculator, ruler etc… …and the lower drawer that contains anything money related – current receipts, card readers, some left over travel money and cheque books (that are rarely used now). I hope you can tell these are the ‘after’ photos as I had a big clear out and only put back the items that are frequently used. Any infrequently used items have now been moved into the craft cupboard in one of those sectioned A4 storage boxes and the older household receipts are in a box file on the shelving unit. Having only what I need to hand and getting rid of any surplus ‘stuff’ has made it a joy to open these drawers every day and easier to tidy my desk each time I use it. Tackling the clear out and cleaning in small stages gives me chance to evaluate what I need and use and work with it for a few days until the space is simplified down to the basics. Moving on to the craft items my first task was to sort through the mass of ribbons I had collected over the years. I had a stack of narrow ribbon hanger loops that are used to keep garments on the hangers in shops and I always cut them off – they are perfect for using on cards and tags and I have tied them up into neat bundles by colour range. March has probably been my most creative month since the advent period last December – and I have enjoyed it. I finally got started on the knitting and made some cards – not quite so productive as many bloggers are but I am pleased with myself for carving out some time to just do something. I still have to sew the little knitted jumper together before I can finish knitting the hood. I think I would have done it sooner if I felt I knew what I was doing – but ready or not I will have to have a go. Now I have caught the creating bug I have been looking for new ideas. I borrowed these two books from the library. The cards turned out quite well – they are not great works of art but they have reduced my pile of decorative papers and blank cards and will save me money on buying them – so a win win situation. The ISA’s that matured last month remain as instant access accounts for the moment as we will be arranging a free advice session with the lovely man from Hargreaves Lansdown and hopefully have a better idea afterwards of where to invest it. I will be posting my March financial tally soon to review how we coped financially through this month. As readers may know I work out our finances on a calendar month basis and have found the four weekly pension payment to be difficult to manage – but this month I have I had a bit of a brain wave which will might just solve the problem – I will talk about it more on the ‘Tally’ post. I continue to plan menus in order to save money and food waste and have been making some of those good old-fashioned favourites like these Homity Pies and creamy rice puddings. Spring might be upon us but needless to say with the recent turn in the weather we are still making homemade soup and have not yet swapped our winter meals for anything a bit lighter. On Shrove Tuesday I made savoury pancakes stuffed with leeks and mushrooms and baked in a cheese sauce. This year to save money I didn’t buy the buckwheat flour and used ordinary, that was a big mistake as they came out a bit too ‘claggy’ for me; the buckwheat has a better flavour and makes a less ‘gooey’ pancake more to my liking. I did eat them but did not enjoy them as much. Mother’s day I spent the whole day gardening at home – which is just what I needed after being away so much. We had easy meals – just DH and I together – so for me this was a perfect day. We had a visit in the evening from my elder daughter who lives locally and brought the beautiful bouquet; the day before we had been staying at my younger daughter’s house and she gave me gardening vouchers. Libbie (Little L) chose the card with the sequins – they change direction to reveal a golden heart – I will keep it for her. Of course both my daughters are mothers themselves now, so I try and take a back seat so they can enjoy Mothering Sunday with their children. We had our trip up to Scotland. We worked far too hard up there – we must learn to pace ourselves more now we are that bit older and that bit more creaky. Apart from the aches and pains we did enjoy our time away and a stroll along the beach. The sea air (or the Vitamin Sea) as Jill calls it on her blog ‘Land of the Big Sky’ is the best prescription after a long winter. When mum was down here visiting we had our usual day out in Derbyshire; stopping for a picnic lunch in Foolow beside the duck pond. Afterwards we had a change from Tissington and went instead to the nearby little village of Hartington to test out their tea room of course. I bought a knitted thermal hat for £4.99 in the sale at the Country Store for next winter. I may need it now if it does snow. So that was my month – full of ups and downs as most of them are but everyone managed to keep well and although the spring cleaning didn’t really get underway I am now the proud owner of an empty ironing basket; the days of the ironing mountain are long gone – I am keeping up to doing a little each day and it feels so good to walk past the empty basket. It has become such a habit I can now focus on something else that I wish to change. back again soon with a new list of my April intentions. Back at home now – it was quite a long day yesterday; there are always little bits to take care of in the garden before leaving, watering in the plants I have moved and putting chicken wire around the emerging ones to ‘bunny’ proof them. Then I pack and clean the caravan. By the time we are on the road I am feeling rather shattered sometimes, but it was a good journey, not too much traffic and no motorway closures. Today I was up and showered, finished the unpacking and then took time to catch up with the post, the messages and life at home in general. I always clean the house before we go so it is nice to walk into when we arrive home so no housework needed today. Once everything was unpacked I then had to repack for our trip up to North Yorkshire tomorrow to stay with my younger daughter, Libbie and Sweetie for a couple of days. In the afternoon we had to collect a parcel, return some library books and go to Sainsbury’s to buy some fresh vegetables, milk and yoghurt. I have a Quiche to make to take with us tomorrow for our evening meal at our daughters. Whilst in Sainsbury’s I bought my mum, who we will visit on Saturday, a lovely indoor basket of plants for Mother’s Day. So once the car is repacked we will be all set to go again. I am not sure if I will manage a post in the next few days but I will as soon as possible. I am looking forward to looking after Sweetie for the day on Friday; Libbie (Little L) will be at school and their mum will be having her dental work done. Ouch! Signs of new growth everywhere – Spring is well underway now. Today at last was bonfire day, calm and sunny. We couldn’t light it yesterday because as soon as the caravaners had gone home and it was safe to start the fire the weather turned and the wind was far too strong. Once lit we burned the box full of old file papers from home to save having to shred it all and then I had to run round pruning everything in sight, that can be pruned at this time of year, to get it all on the bonfire before the fire went out. I do like to wait until I can see some nice new buds appearing so I have something to cut down to – I am always nervous about pruning too hard lest I kill the plant altogether but most of the shrubs had plenty of strong healthy buds. As usual I did not manage to get all the pruning done – we have far too many shrubs and so the rest will have to wait for another visit if it is not too late in the season. I did give our new loppers a good testing though and my arms a serious workout. I now have serious aches and pains too and extreme muscle fatigue and can hardly lift them to drink my cocoa tonight – but it did get me out of doing the washing up. Hope they recover for the morning we have packing and cleaning to do. After the mammoth pruning session I attempted to weed the stream bank border that is full of …you guessed it campion. Such lovely wild flowers but a border full of campion is a campion too far. Hidden amongst the campion I came across some more of those annoying wild garlic plants posing as bluebells, the leaves are similar, but their days are numbered as I have now become an expert at differentiating between them. I managed to uncover the two Hydrangeas and Geraniums that I knew were somewhere in there and barrowed away 4 bags of weeds which will go to the landfill site on our next visit. So by the end of today I have part cleared all of our borders but actually finished none…oh well tomorrow is another day and the weeds will still be there on our next visit. DH has done better and has completed the ditch clearing and the water has drained away so quickly that in an instant the muddy puddle where the pond had overflowed is now completely dry again. I can’t say the Primula are happy about that though as they were enjoying being waterlogged. Tomorrow before we go home we need to cut some chicken wire to put around some of the more attractive plants (attractive to bunnies that is). They seem to love nibbling the young new shoots of my Delphinium and Dicentra and chicken wire is the only way to stop them. I didn’t even stop today to take photos – hopefully I will tomorrow when I try to get some pictures of the inside of the cottage to do my long overdue update. Thank you for all the lovely comments about my cards – there really was not much effort to it but I enjoyed making them and using up some of the craft mountain I have accumulated – and will enjoy the savings I make too. 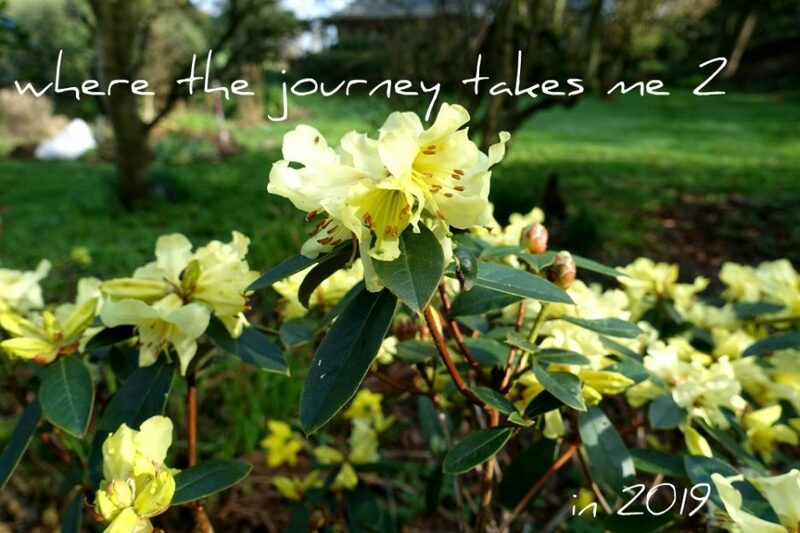 Welcome to my new followers – I hope you enjoy the journey. I must be on a bit of a roll creating things. On Sunday afternoon I sat down with a box of card blanks and a pile of decorative papers of one sort or another to make some cards. Normally, I would make cards from some of my own paintings and sketches. This is one I often make for friends and family celebrating a special milestone birthday. It is a concertina card with a verse running through it and folds up into a little keepsake book. You could easily make something similar using some of those ready printed pictures on sale in craft shops. …but I wanted to use up the some of lovely scraps of papers I have collected over time and do something rather different. I especially like the fact that I am saving money at the same time as saving the planet by recycling pieces of old wrapping paper (you know those little bits that are too small to wrap a present) and cards that are given to me, and even nice pieces of printed cardboard from packaging items. Anyone can make these cards it only takes some card blanks and a roll of the double-sided tape, a Pritt stick and scissors (though I would strongly recommend a ruler and a scalpel for a sharper clean-cut). You do not need any specialist equipment or any expensive craft papers. The cards below are made from some lovely wrapping paper I had with delightful paintings of china teacups. These off cuts were too nice to throw away so I made each of the cups into a card. The two smaller cards are firstly covered in a piece of decorative backing paper that come in packs or pads from craft shops as it is a good weight to stick thinner wrapping paper onto; then the teacup picture is stuck on top of this in the centre and finally I cut some striped paper into thin strips and made a simple border to complete. The larger one is made by using one of those blank cards with a pre-cut window – so you mount the picture behind the window – very useful for cross stitched panels – in this case it nicely frames the teacup. The two below are actually made from some lightweight card packaging – I can’t even remember now what the packaging came with but again I saved it thinking it would come in handy for something. I was able to make matching tags too and I will add a greeting or other embellishment when I find something suitable. The next two are made by recycling cards that were given to me. I cut the front off the card on the left and placed some pearl pink paper behind before sticking it down on a card blank. The one on the right is a card front stuck onto one of those accordion card blanks and I will decorate the inside of this too by adding some suitable prose. For these and the ones above I used the double-sided tape here rather than Pritt stick to stick one onto the other as the old cards and packaging I am sticking down are a heavier weight than the papers I used on some of the smaller cards. Once I began there was no stopping me and it was one of those afternoons when you really feel you are ‘in the flow’ if you are familiar with the expression. Whilst in The Range I bought a packet of those ready printed messages that say – Happy Birthday or Thank you just to embellish them a little. So I added a little greeting to some of them – but some I will leave blank and then when I need a card I can add the most appropriate greeting at the time. Others I will make into Easter cards if I can find some Easter greetings in town. Most of these are just the tiny Papermania cards – just less than 4″ square – and although very simple I think they are quite effective and a good way of using up old papers. So far I have made about twenty-five but I have card blanks and papers to do many more. Sooze at Her in Him out 2 – I hope you might find this post useful. If you want to live more simply then try living in a caravan and you will undoubtedly satisfy that desire. There is no room for any extras on board – only the basics. Clutter is not a word that I would recognise living here as there is none – everything in the caravan is a considered item and has to have a home otherwise you would soon find yourself falling over things. The cupboards are few and none too generous in size so sometimes you have to be very creative with the space. We have just enough dishes to make and eat a meal, nothing to bake with but then that must be healthier, although I did bring an apple cake with us, we just eat fruit or nuts, oat cakes, crackers. No puddings either but we have the occasional ice cream treat. We have only a minimum of bedding and towels – one of each in use and one spare, just enough clothes for gardening and trips to town and a few necessities like toiletries and cleaners. We do have a small Dyson, a small bucket and a tiny hand brush and pan…that just about sums up the cleaning aids. We eat very simple food as we have no electrical equipment like a blender or food processor. Our pans consist of a large 3 tier steamer, a milk pan, a medium pan with a lid and a frying pan with a lid. We also have a colander and I might consider buying a lettuce spinner for the summer as my one luxury. Above the fire-place there are three shelves for decoration and display. I display only a few decorative items on here – a glass vase with a collection of tiny seashells inside, an empty vase for when I pick a few flowers, a little bowl full of dried rose petals from the garden, a lino cut picture of some geese by a local artist (our only picture) and a tiny set of wooden houses. The other items come under the useful rather than decorative category – a small china mug, a water jug, some heavy stemmed wine glasses that we use for most cold drinks and a clock with a lovely soothing tick. We keep a small selection of books mostly gardening books for information and ideas and a novel or two. I also keep a box with a few stationary items – stapler, sellotape, scissors and the like, some coloured pencils and a notepad. We have a folder for instruction manuals and another for the few bills we have, water, electricity, council tax and that is our filing system. At home we have a large filing drawer with the archived papers in the loft. Of course there is no loft here – instead there is a little storage space under the beds but they are empty – we have no need of anything to store – we use everything we have here. I don’t even keep any spare bedding for the 2nd bedroom – I am not expecting anyone to stay. I can look at something and think – yes I have used that in the last couple of days and it is a good feeling. If I were a nomad and had to pack all this stuff up to move on I daresay we would have even less. For entertainment we play cards, read, write blog posts, of course, or listen to the radio. We have no television nor want one and at one time we had no internet connection so only brought the lap top with us if we just needed to access our documents and didn’t need to access the internet – now I can attend to my blog while I am here but that is all I do. The mobile signal is quite pathetic at times so no-one tries to contact us and we rarely phone anyone other than my mum to check on her and my daughters just to let them know we are still alive. Being so disconnected from the world might not suit everyone but I love our little retreat here – I could easily live here full-time but on the other hand I do not want to miss our new grandchildren growing up. It is a dilemma not easily solved. Today was another sunny day in the garden, slightly cooler but pleasant. I have been on weed patrol again digging over boarders and filling in the rabbit holes where they have scratched the surface to get at the plant roots. I will have to get more chicken wire to protect my young plants. Funny they don’t like the campion – there is plenty of it. DH did a bit more of the ditch – here he is with his shovel and barrow (he is a bit blog shy – so only half of him). Hopefully it will stop the pond overflowing onto the path, though the primulas quite like the water. ……. And then he shimmied up the old apple tree to lop the top off. All our best apples grow at the top. It is a half standard tree that was planted by the previous owners and was left to grow unchecked so it is a bit of a beanstalk and we have to wait for the apples to drop off rather than pick them. Now it has been checked I have no doubt it will retaliate by not producing as many apples this year. A day of pleasant pottering and pondering.